Sheryl Crow tells us that "a change would do [us] good" ("A Change Would Do You Good", Sheryl Crow, 1996), and so I put this advice to practice by switching up our usual Sunday brunch routine of pancakes and bacon to a more fancy, upgraded brunch entree. It's no secret by now that I love pancakes, considering I'm constantly rambling on about pancakes--its variations, the different toppings and additions, etc.--but with my dad's birthday being tomorrow, I thought I would make him his favourite, that being waffles. Don't get me wrong, I like waffles too, and it's great how versatile waffles can be. Serve them with syrup or fresh fruit and it makes for a wonderful brunch; pop frozen leftovers in the toaster for an easy on-the-go breakfast; serve with a scoop of your favourite ice cream and a drizzle of chocolate fudge sauce for an instantaneous dessert; or make them with less sugar for a savoury version. Regardless of how you like to enjoy your waffles, they are just as easy to make as pancakes, and comes with a nifty gadget to play with: the waffle iron. Since waffle batter is very similar to pancake batter, it is not the process of making it (or eating it for that matter!) that is a turn-off for me, it's the aftermath. The clean-up job required when all the waffles are done, and the iron has been unplugged, can leave me with such a headache that I often ask myself, "Why didn't I just make pancakes instead?" Making waffles takes a little practice: too little batter and you won't get the "perfect" waffle, but too much batter and you'll get a lava-flow of batter oozing out of the iron and onto your counter. As delicious as waffles can be, those happy thoughts can quickly be forgotten when you find yourself standing in front of a waffle iron crusted with oozy batter, or its remnants in the form of dried, crusty leftovers stuff to the sides of the iron. Hence, waffles at my house have now become a rare occassion, and when I do find the heart (and time) to dig out the waffle iron, I make sure to make a larger batch so that I can stash a bunch of waffles in the freezer to last us a couple of weeks. I added pecans and some pumpkin pie spice to the waffle batter, but you can just as easily replace the pumpkin pie spice with cinnamon, or leave out the nuts and spice altogether. I served these babies with some sliced bananas, warm apple compote and maple syrup. 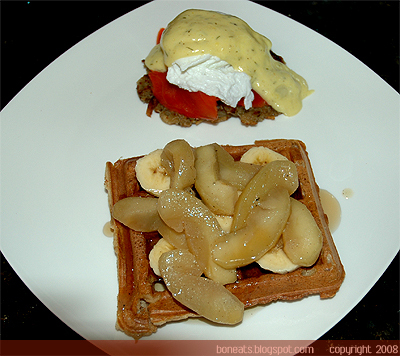 To balance off the sweetness of the waffles, I also made something savoury for the taste buds, a variation on the classic Eggs Benedict. 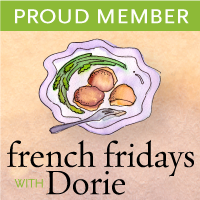 I made some Herbed Potato Rosti the night before and simply reheated them in the toaster oven this morning. 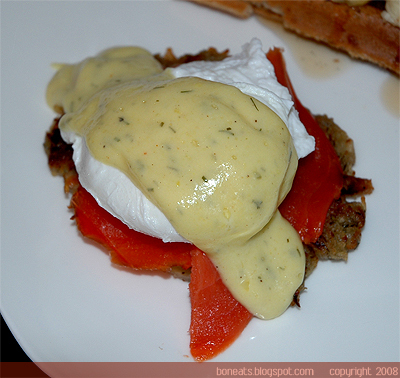 Topped the rosti with a few slices of smoked salmon, a poached egg and dill hollandaise sauce. This is definitely a dish that'll easily impress anyone without having you to go through a lot of trouble to make! Lightly grease and preheat waffle iron. Place flour, sugar, baking soda, baking powder, salt and pumpkin pie spice in a medium bowl. Stir with a whisk to combine. Pour the lightly beaten eggs onto flour mixture, and pour buttermilk, vanilla extract and melted butter (or oil) on top of eggs. Gently stir ingredients together until they create a lumpy batter. Do not over mix. Sprinkle about 2 tbsp of the chopped pecans onto the waffle iron. 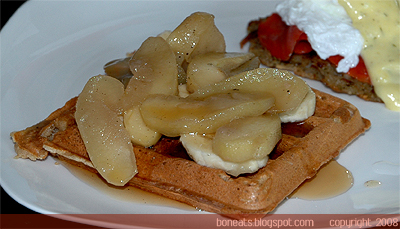 Spoon 1/3 to 1/2 cup batter into prepared waffle iron and bake for about 3 to 4 minutes, or until crisp and golden. Repeat using remaining batter. Keep waffles warm on a baking rack in a 200°F oven until ready to serve. Posted by Bonita at 2:34 p.m.